It’s true, the snow has incredible this season! But if you’re looking for even more fun, there’s more to the mountain than skiing and snowboarding. Make time to experience these Breckenridge winter happenings and dig into snowy fun on the other side of the mountain. Twist, dip, turn, squeal and try not to use the hand brake while you zip down the mountain on 2,500 feet of elevated roller coaster track. 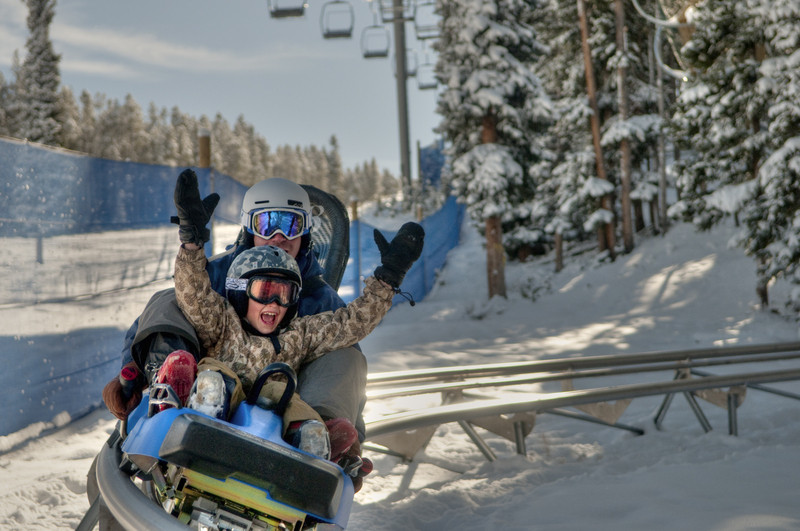 Breck’s Gold Runner Alpine Coaster runs all winter—ski boots and goggles welcome—and whips through the forest along hairpin curves at the base of Peak 8. Ages three and up and a minimum of 38″ tall are welcome and adults can ride with little ones, sitting behind them and controlling the braking system. It’s a real adrenaline rush and the perfect easy-access break for tired ski legs. Switch things up with a pair of skinny skis and you’ll be treated to empty, wide-open groomed trails, stunning views, quiet forests and a remarkable full-body workout. The Breckenridge Nordic Center is located just down the hill from the ski resort and stretches along 1,400 acres. Stop into the lodge for your trail pass, equipment rentals and to sign up for lessons. Ask about the guided adventures to experience a real deal history and geography lesson. Tip: Unwind in the cozy log lodge over happy hour and live music on weekends from 3 to 5 p.m.
Tucked between town and the base of Breckenridge Ski Resort’s Peak 8 (you know, that pristine area you float above in the BreckConnect Gondola), Cucumber Gulch designated wildlife preserve is comprised of 77 acres of wetlands and is home to healthy moose, elk, deer, beaver and bird populations. Pick up snowshoes and a trail pass from the Breckenridge Nordic Center and go explore this rare, idyllic wildlife sanctuary. See the ski resort in a whole new light on a free naturalist tour hosted by local nonprofit Friends of the Dillon Ranger District. The Ski with a Ranger program offers free guided interpretive tours Fridays 11 a.m. to noon. Meet at the top of the Independence Chair on Peak 7 and follow volunteer ski rangers down beginner and intermediate trails, stopping to chat about flora and fauna, spot animal tracks and delve into the area’s intriguing history. All ages are welcome. Guests must have a valid lift ticket and intermediate skiing or riding ability. No pre-registration is required. 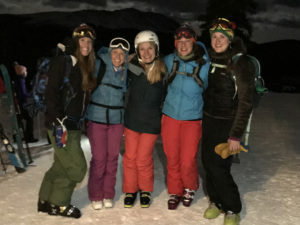 Celebrating its second year, Breckenridge Ski Resort offers a handful of these special moonlight ski dinners each season. (The next one is March 18, 2019.) Get a group together for an uphill skinning or snowshoe outing from the base of Peak 9 to the scenic TenMile Station. The TenMile Tour & Dinner unfolds beneath the stars, along a groomed moonlit trail. 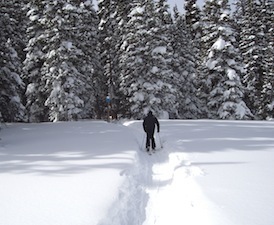 Skin or snowshoe at your own pace until you reach the restaurant where a gourmet buffet and dessert bar await. Tip: Bring comfy slippers to wear during dinner and give your feet a break from ski boots.